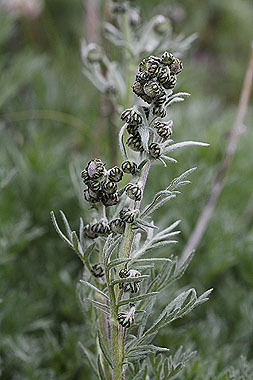 Alpine Sage is the most common sage of the higher elevations. 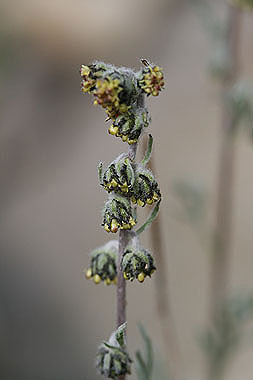 Bracts on the heads of Alpine Sage are hairy and have dark margins. Flowers heads are about 1/4-inch in diameter, with 5 to 25 heads per stem. Leaves are twice pinnately divided. 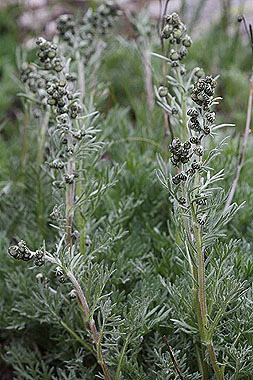 The less common Artemisia pattersonii (not pictured) generally has 5 or fewer heads per stem, and the heads are slightly larger. Leaves of A. pattersonii are only once pinnately divided. Artemisia norvegica (not pictured) is another sage growing at high elevations. A. norvegica also has pinnately divided leaves and heads slightly larger than A. scopulorum. The flowers of A. norvegica are hairy but the receptacle is not (you'll need to look closely with a hand lens).